The Cluny 1400 expands the capabilities of the Cluny by adding a ambient-temperature cabinet or warming cupboard to the two full-size ovens. 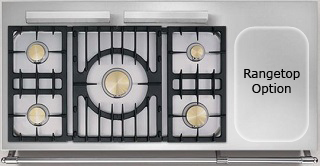 The extra hob space allows you to add an option of your choice: additional gas burners, grill or flat-top grill. The warming cupboard can hold up to 12 plates. Its temperature is thermostatically controlled and adjustable from 27 °C (80 °F) to 110 °C (230 °F). 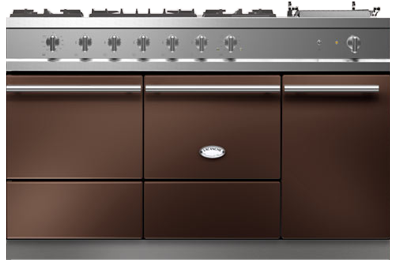 The additional cabinet / warming cupboard can be added either to the left or to the right of the two full-size ovens, depending on your kitchen configuration and ergonomics. 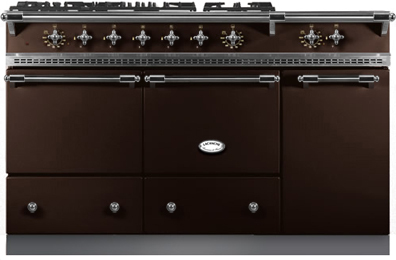 Our Classique top includes our signature high-output, 18,000 BTU burner, along with (2) versatile 11,000 BTU burners, a powerful 15,000 BTU burner and a low-heat simmer burner. All of our Classique tops also include our simmer plate accessory for complete versatility! Our Tradition top includes a large cast-iron French plate over our 18,000 BTU burner, creating a large cooking area for delicate sauces and dishes, complemented by (4) stepped burners, from 5,000 to 15,000 BTU. 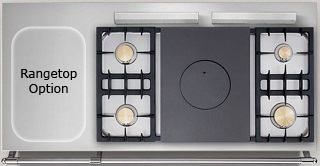 The central plug can also be removed for direct access to the burner for high-heat wok cooking!